On this particular morning we thought it would make for an interesting science lesson if we could show the little ones just how a spider goes about having a morning snack. After some searching in the yard we came across a grasshopper a bout two inches long, which we brought over to the spider as somewhat of a peace offering: don’t come inside the house and we’ll make sure you start the day with a full tummy. 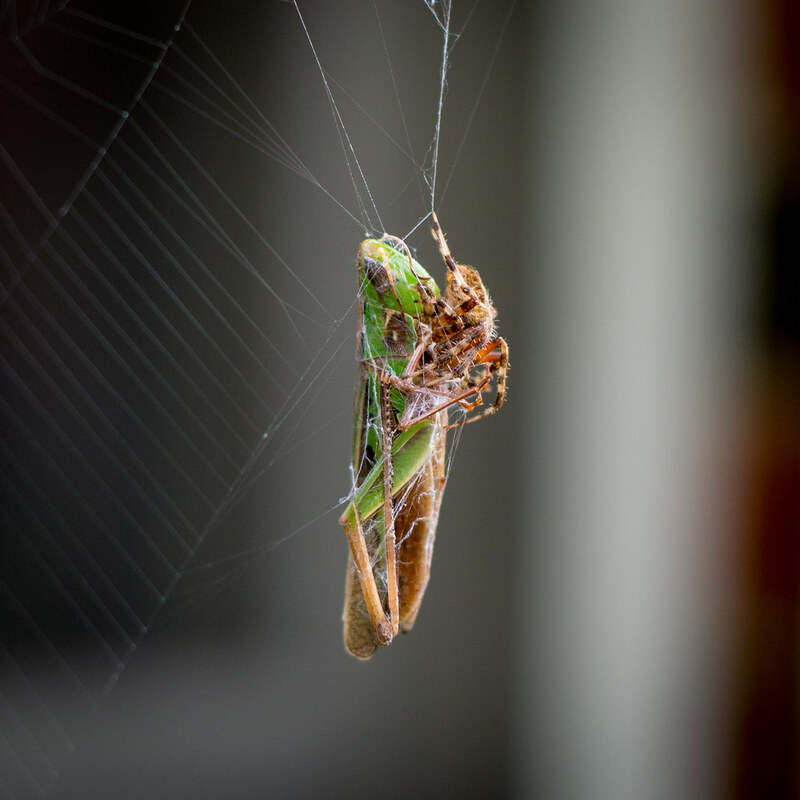 For a while the spider seemed kind of intimidated at the green insect that we put in its web, and it spent a good 20 minutes huddled on the opposite side far away from the grasshopper. It was quite similar to a scene in my backyard a few years earlier in which we fed some grub worms to a garden spider, though in this case the prey was much larger than the predator. A little while later one of the kids ran back to check on the situation, and wouldn’t you know it, the spider had wrapped the grasshopper in silk and was taking a break while waiting to further subdue his first catch of the day. It was a fascinating, if strangely grotesque, look into how nature operates and something the kids will probably remember for a while. Of course I had to document it with my camera, so a little while later I went out with my trusty 50mm lens (which, with a reproduction ratio of roughly 0.15, is hardly a macro stalwart) and took a few shots from several different angles. This one was shot at f/2.8, 1/180 second, ISO 200 and severely cropped in order to get a much better look at the subjects. As much as I talk about my D200, I knew I would need the extra resolution of my D7100 for cropping purposes so I used that instead and I sure am pleased with how everything turned out. So was the spider :) The grasshopper, well…not so much. Great capture, Simon (and for the spider too)! Spiders are horrifying and amazing creatures. Julie, you are going to be the best grandma that little girl could ever ask for :) She and you are going to have so much fun exploring nature together! That is quite a clear image for a crop. We have the same policy toward critters at our house. Outside, we respect you, inside, you are at the mercy of Mom. I took a similar image with my D200 and it was not nearly as clear, but my D7100’s 24 megapixels gave me a lot more room to crop in post. I guess sometimes megapixels really do matter. Nice work. First, the fine detail produced is eyeopening. You can count the hairs on the spider! The individual threads of the web are also well defined. Secondly, great bokeh with aperture set at f2.8! I would have set mine to f1.4 because I am still learning that, to create bokeh, you don’t have to open up the aperture to its widest. I am going to practice this weekend on shooting subjects using different apertures. Finally, the subject of the photo is very intriguing. A spider preparing its victim for storage and consumption is a compelling story. Our God has created an amazing world. We, as photographers, can capture some of it. Thank you David! You’re right about creating bokeh: you don’t always need a big aperture, and it’s something I’ve been learning for years and still have trouble doing from time to time. I often want to shoot wide open even though that can cause more problems than it’s worth :) In this case, getting very close to the subject also helped blur the background even with a smaller aperture. God certainly did create a wonderful world to explore, and as a photographer I’m honored to get the privilege to capture even a tiny sliver of it. Good article, Simon. You should be submitting these to a photography magazine! Aha, the grasshopper? Not so much! Ha! Funny! Don’t be quite so hard on yourself, Simon. You do GOOD work–not only with your photos, but with instructing us the great unwashed! Have a blessed day!